Many bow hunters can’t wait for opening day of deer season. Bucks are still on summer feeding patterns and are still fairly dumb when it comes to recognizing hunting pressure. It doesn't take long for deer to figure out they’re being hunted. Then bachelor groups begin breaking up and crops start coming off the fields. Feeding patterns really begin to shift when acorns start hitting the ground. 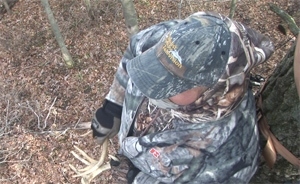 Deer season often seems to go into a dead phase until the rut ramps up. My fishing buddy likes to say, “they just quit biting.” This time of the season usually occurs in early October and is often referred to as “The October Lull”. This time of year can be incredibly frustrating to hunt. I’ve had stand sites that were very good the prior season and earlier in the current system go cold. Sightings go from ten or twelve deer per sit to zero. Where do the deer go? They don’t disappear. They’re just in different spots and feeding on other food sources. A deer’s world goes through some profound changes in early October. They are simply reacting to those changes. As leaves begin to fall from trees and the under story, the cover deer have utilized throughout the summer may be rendered useless. Deer may have to seek out new bedding areas. South facing slopes warm faster. This is obviously a disadvantage during the summer months. But as temperatures drop deer seek warmer places to bed down. Changing bedding areas will shift travel routes and feeding areas. Food sources also change. Soybeans are a staple throughout the summer but by October they may be already off the fields or golden brown. Depending on agricultural practices, corn may or may not be standing as October progresses. As fields are harvested, deer move in quickly to browse on spilled corn. This can have a dramatic impact on where deer are on a given day. And then there is the acorn issue. When acorns hit the forest floor deer no longer need to expose themselves in the open to feed. The pastures and agricultural fields they were hitting in mid-September suddenly go cold. The trails deer were using to access those fields are also quiet. One of the other factors that lead to the lull is pressure. Deer hunters have been in and out of the woods more than a few times by the time October rolls around. Small game, bear, and bird hunters may have also disturbed deer. Late September and early October is also a popular time for other outdoor enthusiasts to take woodland strolls. The spectacle of orange, red, and golden leaves is too much for many to pass up. If a few frosts have knocked down the insects, a walk in the woods is inviting to just about anyone. All of this activity educates deer and puts them on alert, especially mature deer. With all of these changes going on, it is tempting to stay home for a few weeks. And honestly, it’s not a bad idea. This is particularly true if you hunt a smaller property. Allowing the property to cool off for a few weeks can be a good thing. But if you’re a hunting junkie like me, passing up a few weeks of hunting just isn't an option. Scouting is productive no matter what time of year you do it. Scouting is especially important during the October lull. Let’s be clear though, it’s not a good idea to go tromping around your property. If you can watch fields from the road, logging trail, or two track spend a night or two watching for fields deer are using. If you can see what fields deer are using and where they are entering, you’ll have a good idea of what they are eating. I take detailed notes of observations from the tree stand and the roadside throughout the season. These offer valuable insight during the season, the following year, and beyond. Acorns can also spread deer out but keep in mind not all oak trees are the same. Learn to differentiate red oak from white oak. Deer prefer acorns from white oak over red oak, especially when there is an abundance of acorns on the ground. If you can note the best trees on your property ahead of time, you’ll save yourself some work and ease pressure on your property. I don’t advise walking the woods during the heart of the season but if you’re working a blood trail, observe your surroundings. You might as well take advantage of any required intrusion. Some people like to move in on bedding areas during the October lull in an attempt to take the action to the deer. In my opinion this is a bad idea. The last thing I want to do is add stress and pressure to deer just a few weeks before peak hunting begins. If you do feel the need to turn up the heat, do some calling or use scents. Some light rattling and sporadic grunting is common in the deer woods this time of year. The knockdown, drag out fights have yet to occur but believe it or not there is some sparring going on. In fact, I have seen bucks engage in light battles as early as mid-September. When it comes to scents, early season hunters tend to use cover scents and curiosity scents early in the year. Estrous scent is something typically reserved for late October into November. This is a big mistake as far as I’m concerned. In late October and early November, estrous scent is becoming more commonplace. That same scent is rare and exciting for bucks in mid-October. Don’t be afraid to use it. Your estrous doe is probably going to be the only show in town. The most successful hunters I've been around aren't the ones with the best properties or the fanciest equipment. That may be hard to believe for some. Most of the very successful hunters I've met spend a lot of time at their craft and aren't afraid to try new things. The best advice I have for overcoming the October lull is to do something other hunters aren't doing. Sometimes you have to use your entire tackle box to make them bite.